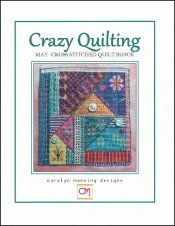 Crazy Quilting: May Block [H5082] - $9.50 : Yarn Tree, Your wholesale source for cross stitch supplies. Cross stitch pattern from Carolyn Manning Designs. May cross stitched quilt block inspired by the art of crazy quilting. A butterfly, hearts, and flowers accent. Stitch count 78w x 78h. Embellishments included.